Well, it was a day of contrasts. The day started like the day before - back on the Loneliest Road, more sagebrush plateaus and mountain ridges. I took the opportunity to go off the beaten track to visit the Ward Charcoal Kilns. These brick beehive like structures have a timeless quantity. 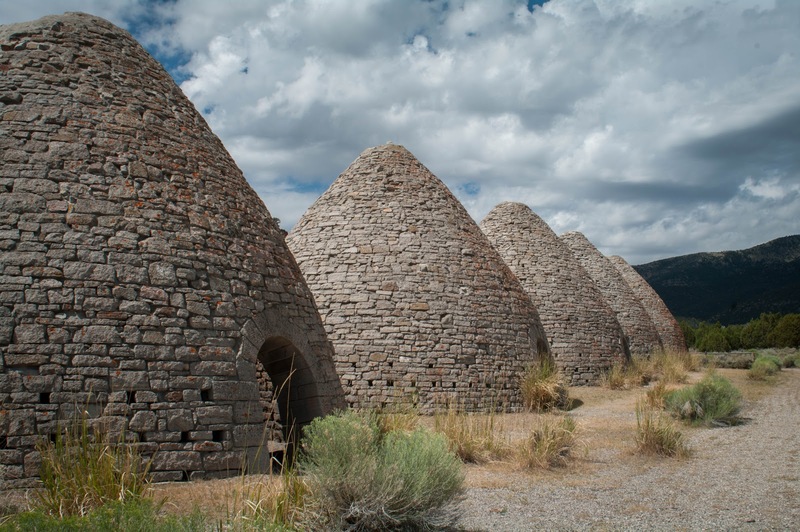 I could have believed them to be 1,000 year old Indian structures, as easily as kilns from Nevada's recent industrial history (1870). Located up a dusty track, the opportunity to go 'off road' was too tempting. They were in an atmospheric spot, a long way from the main road. Very photogenic too. After a bumpy ride back to the US-50 (the car is developing a nice patina of dead bugs and yellow dust now), it was on to the Border Inn. 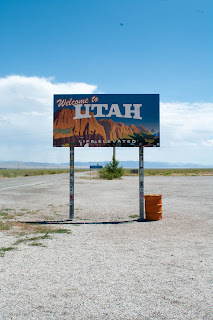 The central conceit of this place has always amused me - it straddles the border of Utah and Nevada. 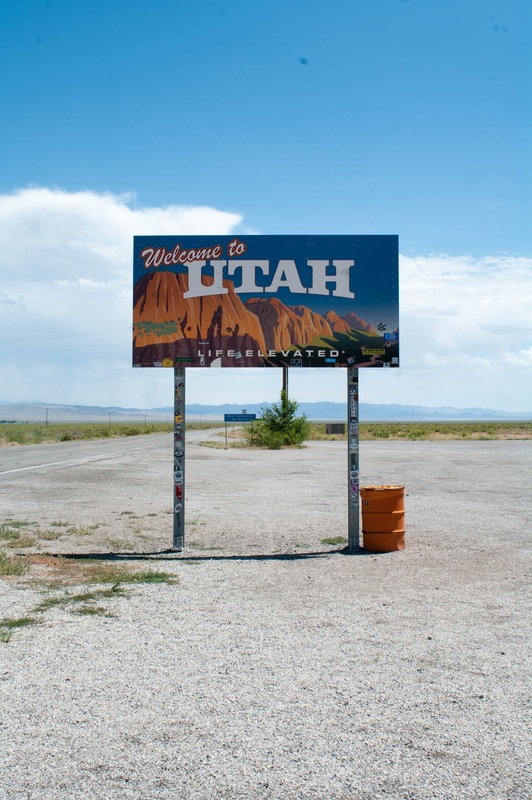 The motel's bedroom section is in straightlaced Utah, because of the cheaper hotel tax. 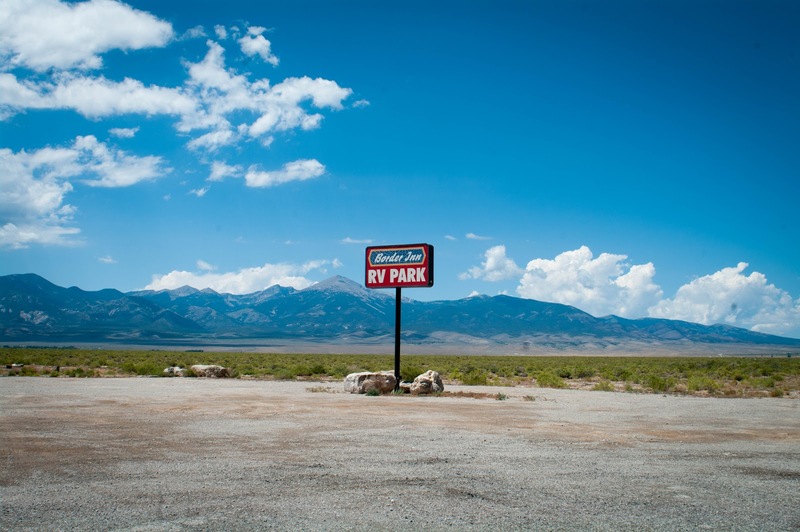 The motel's restaurant is in libertine Nevada, so it can serve alcohol and tempt you with slot machines. 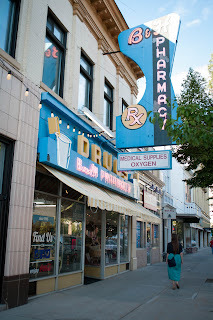 I used the small store on the Nevada side to top up my beer, knowing from bitter experience it's hard to get hold of in Utah. A few more plateaus and ridges later, the landscape flattened out. I would hesitate to call it boring, but it was the loneliest the US-50 had been to date, the longest uninhabited stretch. As the Border Inn's sign warned me, it was 83 miles from the Inn to the next services at Delta. 83 very flat miles. At Delta, the landscape changed. Green pastures, irrigated by the Sevier River, replaced the endless sagebrush. No longer lonely, I small farms surrounded me, and a much more rural vista. US-50 becomes US-6, and I stuck with it, rather than join the interstate. One last mountain ridge to climb, past dusty Eureka (another one! ), and now I'm in the valleys that lead up to Salt Lake City. For the first time, I see suburban architecture. Roadside strip malls, fast food, housing estates, and it's clear I'm in the great Salt Lake City metroplex. My stop for the night is Provo. I didn't expect much from this suburb, but it turned out to be a rather pleasant little town in its own right. It had a preserved downtown and a youthful atmosphere thanks to the nearby University. It wasn't until I went out later that it made me feel a little uneasy - was it too nice? 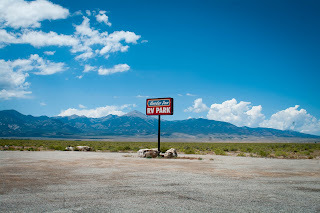 After characterful, but beat up, Bishop, Virginia City and Ely, this town was immaculate. Not a single boarded up shop, not a single bit of litter, not a hair out of place. No baseballs caps, no bearded bikers, aging hippies or tattooed disaffected youth. The young people here was so clean you could eat off them, and all bought their clothes at Gap. The few older people - responsible parent types - were smartly dressed. I was glad I'd dressed up a bit - fresh, clean jeans, white shirt - because that's how every other man over the age of thirty dressed too. A tie wouldn't have looked out of place. Dinner was good - modern Navajo it billed itself as, and how often will you get a chance to eat that? 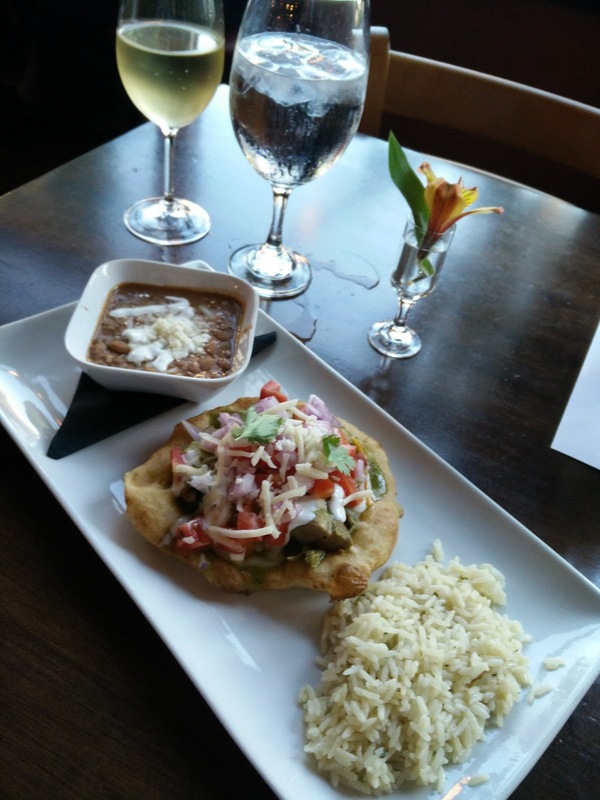 It was South Western cuisine with a twist - shrimp with blue corn grits, tacos made with Indian flatbread. All very tasty. On the way back to the hotel I noted that every single one of the happy smiling couples was holding hands. Had aliens replaced the population of Provo? Or was it simply the influence of the Mormons? I did enjoy the bit of trivia that came with the hotel though. Butch Cassidy used to use it was a safe house - he was friends with the owners at the time - and the current owner was keen to show me the 'actual door' he came through. Butch was also born a Mormon - so not all are squeaky clean! A highlight of my trip. I'd be anticipating this one for a while - modern Navajo is hard to find back in England! Restaurant was contemporary, clean lines, slightly over-friendly staff. Food was great - I had the shrimp and grits with blue corn (not sure shrimp is authentic Navajo, but who cares?) and the green Navajo tacos - slow cooked pork in green chili sauce on a fry bread with rice and beans. Very enjoyable, an interesting twist on Mexican / Southwest cooking.